Neurogenic bladder dysfunction, sometimes merely referred to as neurogenic bladder, it was a dysfunction of the urinary bladder because attack of disease to the central nervous system or peripheral nerves. 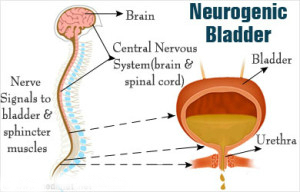 Circumstances like stroke, disk herniation, parkinson’s disease, multiple sclerosis and other nervous system abnormalities may result in neurogenic bladder. It is usually related with spinal cord diseases (like syringomyelia/hydromyelia), injuries such as neural tube defects including spina bifida and herniated disks. It may also be causes by a reason of brain tumors and other diseases related to brain, peripheral nerve diseases linked with pregnancy such as: Vitamin B12 deficiency, Diabetes and Alcoholism. Urodynamic studies (bladder function tests) are performed to measure the capacity of bladder, bladder emptying, bladder pressures and the flow of urine. A cystoscopy may be done to examine the inside of the bladder and urethra (a tube through which urine will passes) with a small telescope (cystoscope). The skull, spine, and urinary tract may be observed by the help of X-rays, computed tomography (CT), and magnetic resonance imaging (MRI). You will be referred to a neurologist for consultation.